They say, ‘the best kind of friendships are fierce lady friendships where you aggressively believe in each other and defend each other.’ PULA Pune Ladies, is an interactive social media platform (Facebook) that caters to all the ladies in Pune. Come what may, the PULAiets have each other’s backs and they believe that the other deserves the world. 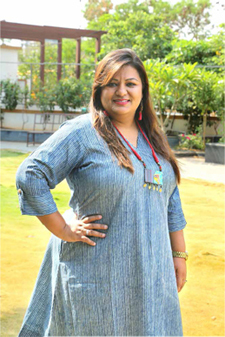 The mastermind behind creating this realm of PULA is Sonia Agarwal Konjeti. Also known as Pune’s Google, PULA was started almost three years ago by Konjeti with a vision to provide a female family and space where the ladies could call it their second home. The Facebook group now boasts of 1.5 lakh members (and counting) who can share their thoughts, family issues, opinions, ask for any kind of help, promote their business, and much more, under the group rules. 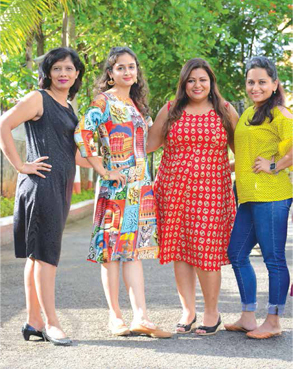 The group is single handedly responsible for providing the Pune ladies an extended family, wings to their dreams and a unique platform for many reasons. Konjeti has now become a public figure. Enter any mall or an exhibition, people recognise her, ask for selfies and autographs. For her, this is a proud moment. 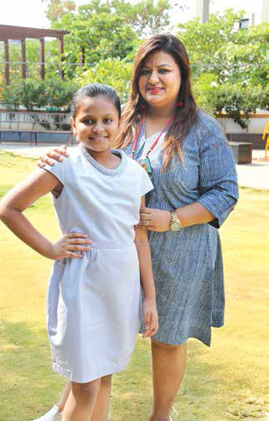 Her baby PULA has blossomed beyond horizons. Driven by passion, PULA has brought in several awards for her, like Women achievers award 2016, Unnati Power Award 2017 Real Architects of the society, Think Pure Award 2017 for Women Empowerment by PNG Jewellers, #MadeByHer, Best Community on FB by Pinkathon and still counting. Born and brought up in Pune, completed my Bachelors of Commerce and Masters in Journalism course from Pune University. I started working with Wipro as a trainee. Soon after finding the right partner, I got married in 2006. For five years I was in Mumbai where I worked with TCS as a trainee. After returning to Pune in 2011, I completed my Bachelor of Education course. Consequently, I started working as a teacher with The Orbis School. We were blessed with Sharanya in 2009. Overall, the work experience was quite knowledge. Was PULA always meant to happen? There are very few people who get to live their passion. And I consider myself lucky for PULA to happen. It’s like we were meant to be. I think my nature of keeping people together, no matter what, being the flag-bearer of starting events and my will to help others has made PULA possible for me. As a child, I use to organise a lot of events during the Ganpati festival. Continuing the tradition, I was a part of several fests in college and office too. After Sharanya was born, I thought of taking a break. The early 2010 gave rise to a lot of Facebook groups. However, they were operative without any rules. After doing an extensive research on how a Facebook group works, I thought that an interactive group with rules will be a boon for Pune ladies. And that’s how PULA was born in 2015. We wanted to connect as many ladies as possible, hence the group did not have an age limit. And for their involvement, we started have dedicated days which spoke about specific topics. How was the group flourished over these years? From a mere 300 members, the group is now a home to over 1.5 lakh ladies. The group has grown exponentially. Since the inception, the ladies stuck to the group rules, which makes me a proud admin. And today, PULA has become a household name. The feedback that we get motivates us to work harder. As the group was growing, the team and I decided to revamp all the rules this January. It’s rare to find such a versatile group where you would find any and everything being discussed as there is no one to judge you. Women feel absolute free and safe to discuss their concerns, personal or professional, and get emotional or practical support from everyone. How has life been after PULA been? All my life I have been an emotional person. But PULA has changed me. It’s my child and I need to take care of it. Taking control of my emotions, the team and I have been able to solve many issues. The group has given me more than I could ask for. My life has transformed completely after PULA. Now that it has become a household name, the popularity is a little overwhelming. Frankly, it is not easy handling such a big group. There are several posts per minute. Scrutinizing each of them is necessary and is quite a task. Every single day I have several messages, calls and mails which speaks volumes about the group. Hence, each day becomes memorable for me. Each message, each milestone means the world to me. Living an ordinary life is much easier is what I have realised. With popularity comes more responsibility. Once you get a little famous, people start looking towards you with more expectations. Your life comes under the scanner and people easily judge you. What holds the group together? Each day there are posts wherein these ladies talk about their personal problems with an intention of getting a positive response or solution. I take pride in saying this that if a lady sheds a single tear, there are thousands of hands coming to wipe off her tears. This is how strong this group is, they uplift each other. And this what holds the group together. One post and the group and the team has done the jobs of police, animal rescue, and others. Once a lady found an ATM card and some documents lying on the road. She put up the pictures on the group and within no time we found the owner of it. Another incident that speaks about the group’s courage is when a lady put up a post saying that her husband is beating her and to save herself she ran out of the house. She was in a village somewhere near Pune. As soon as the post was up, someone tagged the police of that area. Finally, she was brought to Pune to her parents. I still am in touch with her and happy to know that things have settled at her end. Absolutely! The team is doing a magnificent job. The success of the page goes to them and them members too. Such a huge group cannot be managed single-handedly. Without any monetary gain these ladies are selflessly managing the group. Hats off to the team! Does the pressure overwhelm you? I won’t call it pressure, but it sure becomes stressful at times. I have to be the judge and take the right decision for every post. That is when the stress kicks in. I have to do a thorough study, understand the situation and then take the right decision. There are times when I am just about to call it a day, and then a sitiuation comes up. But I have to rise to the occasion. I won’t lie, but it does affect the family life a tad. But as this is driven by passion, we always find a solution. The trick is to manage both and if you love what you are doing, it can be easily managed. Thankfully, I have a supportive family who helps in every situation. Satish, my better half, has always pushed me. I believe in providing the proof. That takes care of everything. I don’t believe in fighting when matters can be resolved by giving evidence. There are times when someone puts up a post against PULA or the members. That’s when I put my foot down and jot the facts on the post. If the person has evidence, they might as well put it forward. Otherwise it’s just a rubbish post. Also, I have learnt that there will always be someone who would never appreciate you. I don’t wish to please them. In day-to-day life there is a lot of stress, so it’s better to start living for yourself. With the recent upsurge of fake news how is the team handling the social media? For the smallest of things PULA is used as a search engine by the Puneites. When there is such a news, our team is on their foot; we immediately check for legitimacy. Other than that, there are subject matter experts or people from the same field who can confirm the authenticity of the news. Some still believe in whatever news is posted. Hence our team is careful while screening such news. Even if there is a slight doubt, we immediately delete the post. How does the team manage the database and security of the page? The authority of page lies with the team and I. There is a strict scrutiny of members’ profiles before adding them in the group. Even after approval if the profile seems fake, immediate action is taken. But sometimes there are things which are not in our bandwidth. In rare cases, the profile may seem bogus even after approval. That’s when the PULA police comes into play. The person is removed from the group as we cannot risk the safety of other women. In a day we get around 3,000 requests to join the group. However, after a check only 800 get through. That’s how tight our security is. You and your team seem very ambitious. What’s next on your plate? We never thought the group will touch so many hearts. Now when we have achieved this, nothing can stop us. The population of women in our city is higher than the members in our group. We wish to include them too. However, we have never tapped quantity as providing the top-notch quality was our only priority. What topped our list was to help the ladies and to make them see the other side of the world, give a platform for the sellers, and organise talks or meets. The world is our horizon and there is still a long way to go as we have to achieve more. How can gender diversity be achieved at large? It the most talked-about issue these day. I am happy to see that the world is working towards achieving it. It is nice to see the difference in diversity at workplaces. As change begins at home, we at PULA are making sure to stir a difference. We have created lots of opportunities where a woman can grow. We nominate women for all possible opportunities and help them stand. Every Monday we deal with parenting issues and on Thursday we have ‘Gyani Guruvar’. The topics discussed here helped broaden the viewpoint of many people. This is getting a change in their life. It’s pretty simple. Do good and good will come to you. I am a firm believer of Karma. And I feel that PULA is on the page of Karma where what we are doing is worth while, which is why it is getting all the attention. Any message for the ladies out there? It’s a difficult world out there which has enough negativity. Hence, I want people to stop judging. Be positive and conquer the world! © Copyright - 2018 Corporate Citizen. All rights Reserved.